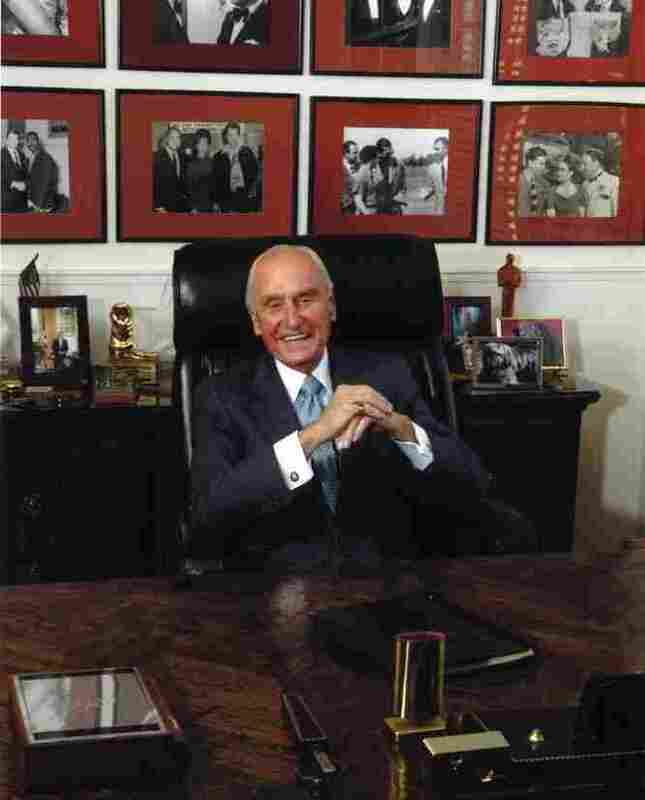 A.C. Lyles in his Paramount office, which is lined with photos of friends and colleagues from his 83 years in the movie business. Lyles has spent his entire career at Paramount. At the 83rd annual Academy Awards on Sunday night, A.C. Lyles may have been the only person in the audience who's been in the movie business for as many years as the Oscars. Though the veteran producer was hidden in the parade of stars, Lyles is a living link to Old Hollywood — he's spent 83 years in the movie business, all of them at Paramount Pictures. Lyles saw his first movie when he was 10 years old, growing up in Jacksonville, Fla. He now keeps a reminder of that film near his desk: an old hand-cranked camera that was used to shoot Wings. "That camera made a picture that changed my life," Lyles says. Wings, a World War I flight epic, won the very first best-picture Oscar in 1928, right about the time 10-year-old Lyles got a job sweeping up popcorn at a local Paramount theater. After a chance meeting with the studio's founder, Adolph Zukor, Lyles wrote to the mogul every week — until he was hired right out of high school. Suddenly, Lyles found himself surrounded by some of the biggest stars in Hollywood. 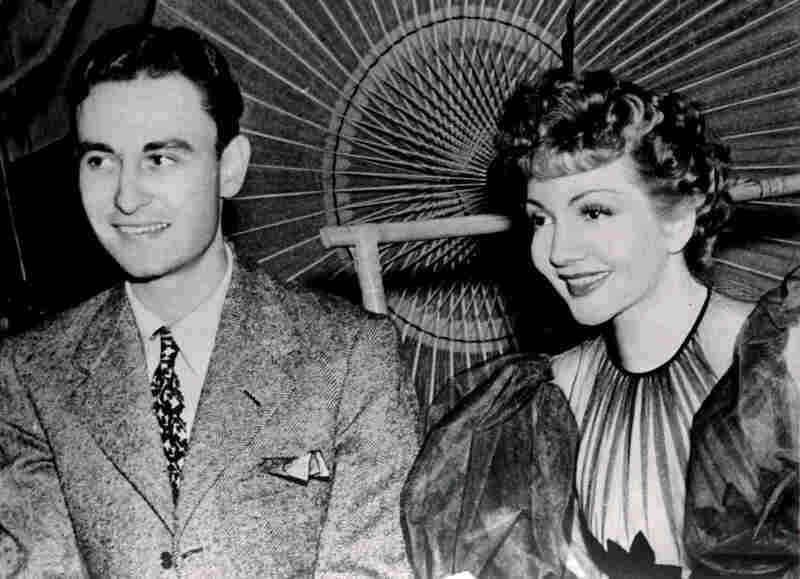 He still remembers seeing Gloria Swanson arrive at Paramount Studios' famous wrought-iron gates with two young girls walking in front of her holding big baskets of rose petals. 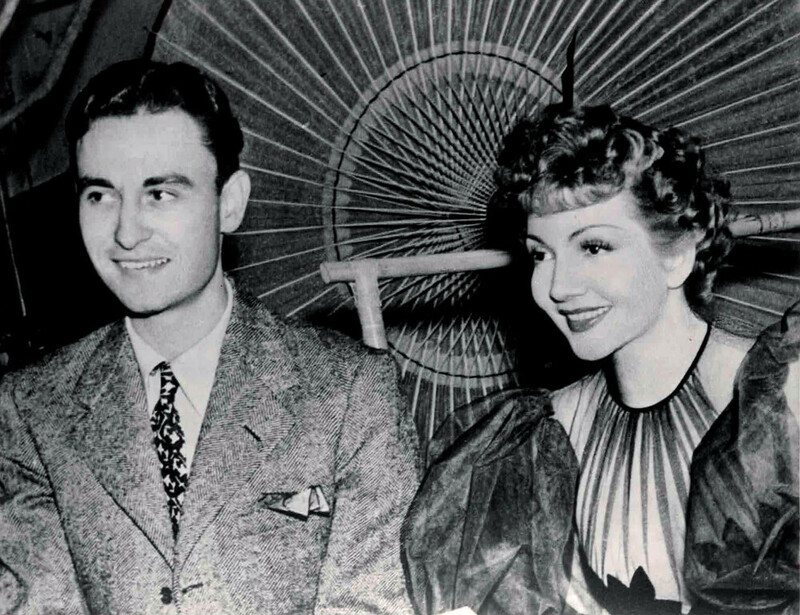 Claudette Colbert won the best-actress Oscar for the 1934 comedy It Happened One Night. She poses above with a youthful A.C. Lyles. "She got out of her chauffeur-driven car, and the young girls would walk in front of her and toss rose petals for her to walk on. That was her entrance," Lyles recalls with a laugh. Because he went to work for Paramount right after high school, Lyles never attended college — but he likes to say that Paramount became his university. Zukor and legendary director Cecil B. DeMille both educated the kid about everything from how to run a business to how to dress for business: Zukor used to quote the old saying to "Dress British, but think Yiddish." To this day, Lyles is known for his elegant Savile Row suits. In the 1950s and '60s, Lyles produced a string of profitable B-movie Westerns, including Black Spurs and Johnny Reno. He believes the popularity of the genre will endure: "The Western is the most moral story you can tell — good against evil, with the good always winning out." Lyles arrived in Hollywood around the same time a young actor named Ronald Reagan came onto the scene. 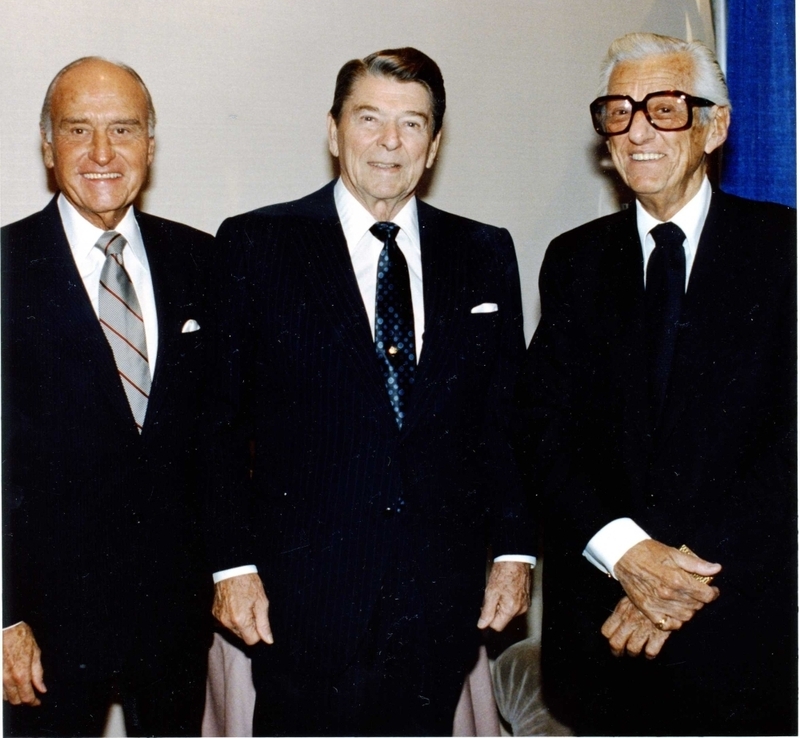 The two friends are pictured above (Lyles left, Reagan center) with talent agent and studio executive Lew Wasserman. At the height of the studio system, Paramount was able to crank out 40 films a year, constantly recycling its talent, directors and producers. Lyles says that couldn't happen today, because financial constraints are a bigger problem. "I think if Mr. Zukor were to come back today ... the cost of production would shock him, because costs have gone up so, so high," he says. Today, on the Paramount Studio lot, in a suite with a panoramic view of Los Angeles and the Hollywood Hills, Lyles delights his guests by pointing out photos of the stars he's worked with over the years: Steve McQueen, John Wayne and Barbara Stanwyck, to name a few. Lyles' office walls are a testament to years of close relationships with the movies' major players. 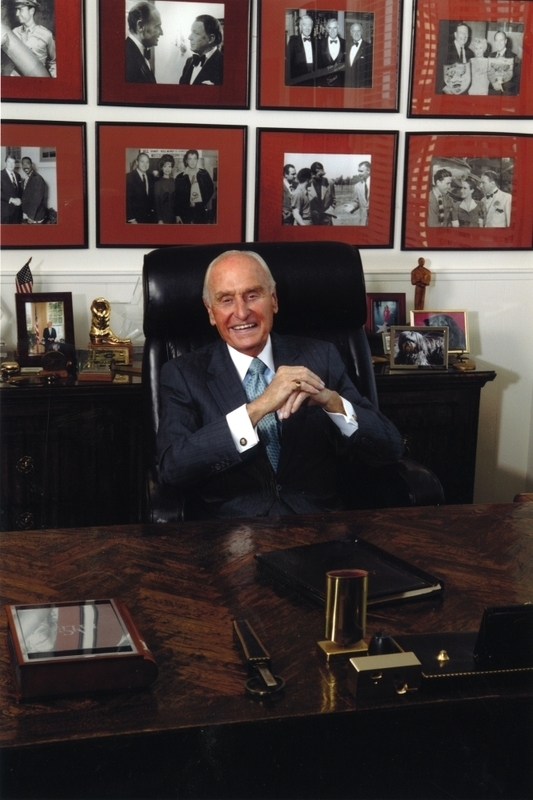 When he celebrated 50 years at Paramount, he even received congratulations from the White House — where his old Hollywood friend Ronald Reagan was president. The two had arrived in Hollywood around the same time, and Lyles had always predicted his friend would end up in the White House some day. Though he will be 93 in May, Lyles still goes to work every day as the studio's goodwill ambassador. He says retirement is not part of the plan, and jokes that they'll probably have to carry him out of the studio lot. "I can't imagine not doing it," he says. "It's just a great, great life."